Awwww, cute! 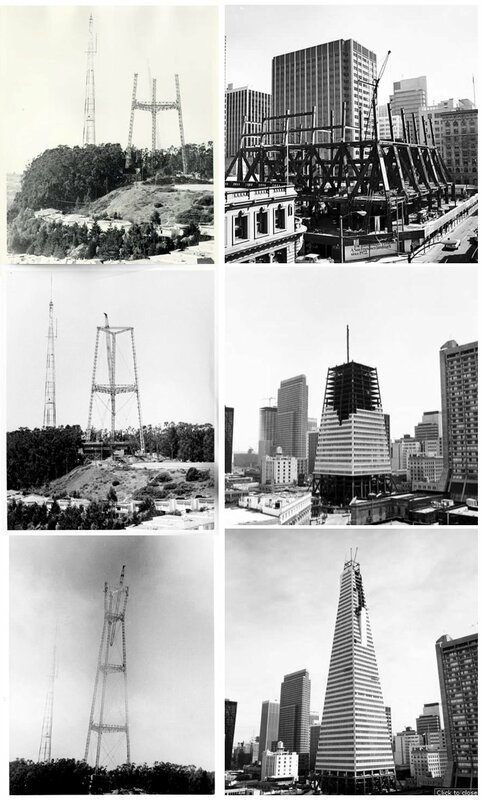 Sutro and the Transamerica Pyramid’s baby pictures! You can also follow them on Twitter — @SutroTVTower and @TransAmericaBdg — there’s some serious sibling rivalry going on there. Me: IF YOU TWO DON’T STOP I’M PULLING THIS CITY OVER RIGHT NOW. Though I love the reference to the Niantic. Touché, Sutro, touché. So in 1973 Sutro had (or was supposed to have) white lights running up its legs, but neighbors complained and we were left with just the red aviation safety lights — if this was the case does anyone have pictures? Those would be awesome, I want them turned back on. I have time-lapse Super8 footage of the building underneath 101 California being torn down, so there. In the pics above, it looks like there should be some baby pics of the Embarcadero as well. if you ever digitize it, let me know, would be happy to post it.